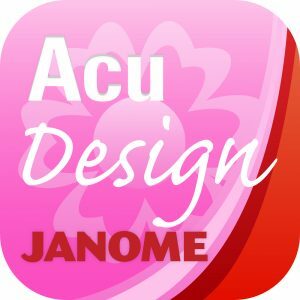 Janome Digitizer MBXv5 is the complete package…..do you wish you could turn your design ideas / drawings into stitches, well you can with this software; simply import your image to fill with stitches automatically or use your image as a background which you fill with your digitized stitches. You may already have an array of embroidery designs, get inspired and generate further designs from these embroidery designs, create layouts, borders, add lettering, add motifs. Create designs and styles from a variety of tools – applique, cutwork, ambience quilting, trapunto, stumpwork, carved stamping, motif stamping, buttonholes, to name a few. This software is a MS Windows®-based product incorporating many of the conventions with which most PC users are already familar. Digitizer provides seamless integration with CorelDRAW® Essentials, the most popular vector-based drawing package for home users. This combination offers more efficient, user-friendly approach to embroidery design. You can purchase this software from your local Janome Dealer. Note: CorelDRAW® Essentials and its sister product, Coral PHOTO-PAINT® Essentials X6 can also be run as standalone applications. Your embroidery software has a single workspace or ‘design window’ which you interact within it with different modes. 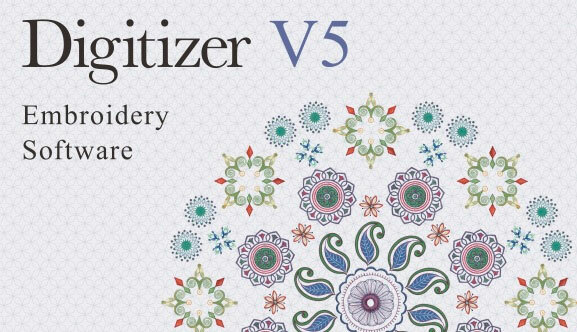 This allows you to modify or create embroidery designs using the extensive toolset. You can have multiple designs open simultaneously and toggle between each via the design tabs. Toolboxes are like toolbars in that they contain software tools. However, each toolbox represents a typical scenario you will be engaged in, such as customising designs or editing objects. Some tools may appear in more than one scenario. As such, toolboxes are organised more or less in order of common operations, starting with managing your designs. – Search for designs by various means, including known design information. – Create an organising structure for easy categorisation. – Batch-convert selected design files to many stitch formats such as JEF, SEW, DST, EXP, and others. 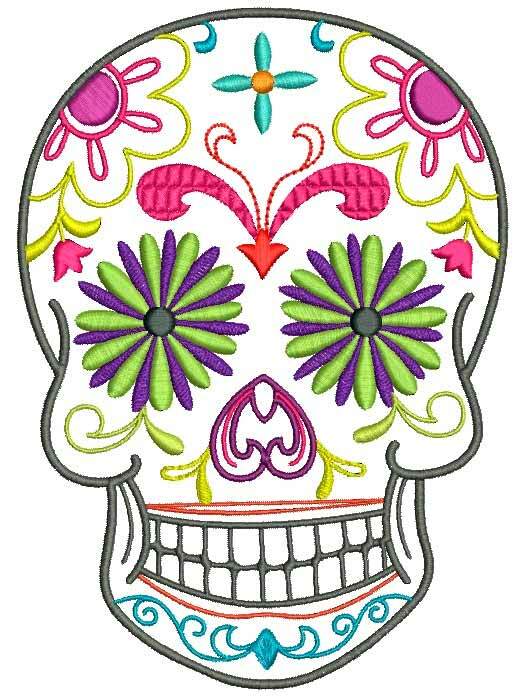 – Print selected designs or send them to embroidery machine for stitchout. 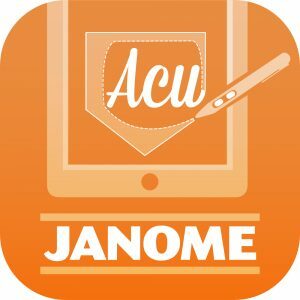 – Find embroidery designs anywhere on your hard drive or external storage device and, optionally, add them to the embroidery library. – Vector or bitmap artwork can be inserted, pasted or scanned into your embroidery software for use as digitizing templates or ‘backdrops’. The Artwork toolbox provides for importing electronic artwork into your embroidery software, editing it, and preparing it for automatic digitizing. – Convert artwork – this software includes as standard the entire suite of CorelDRAW® Essentials drawing tools which offer many techniques for drafting outlines and shapes on screen. 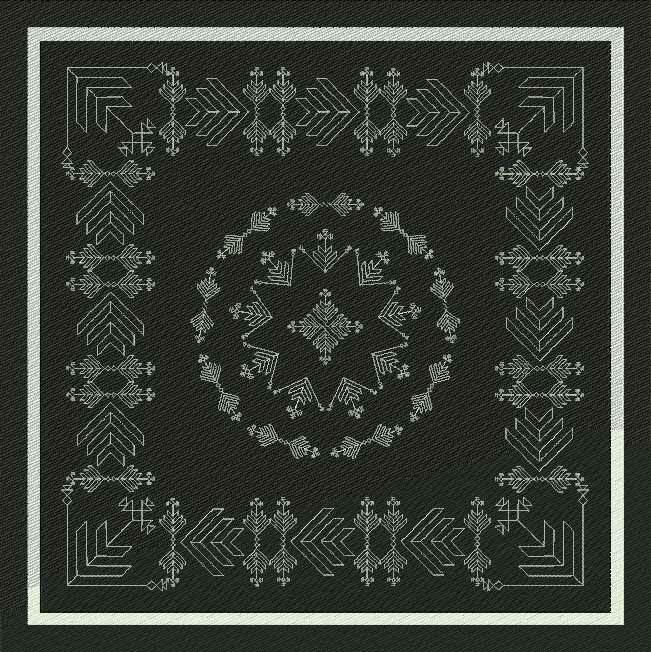 The software runs in what is called Embroidery mode. Conversely, CorelDRAW® Essentials runs in Graphics mode. 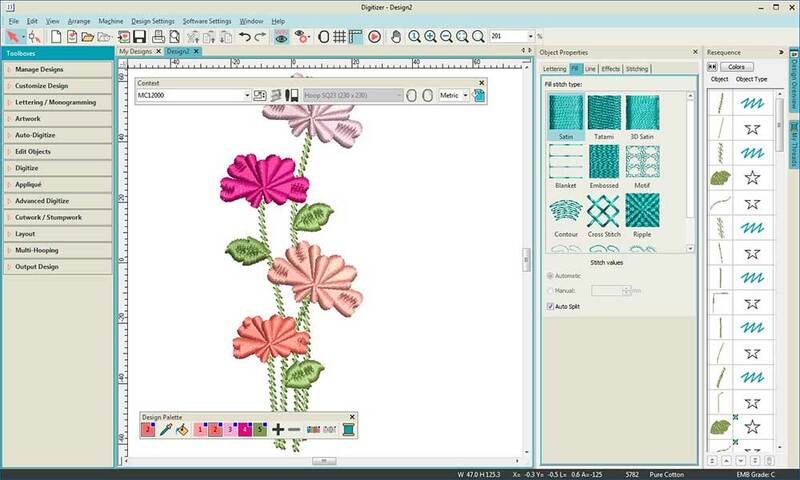 Graphics mode lets you convert vector graphics directly to embroidery objects. You can also convert embroidery to vector objects. – Supports the automatic and semi-automatic digitizing of both bitmap images and vector drawings. – The Click-to-Stitch tools provide everything necessary to digitize shapes in bitmap images automatically without using manual digitizing methods. – Use Auto-digitize PhotoStitch to create embroidery from photographs or other images, color or grayscale. PhotoStitch designs consist of rows of stitches of varying spacing. In addition to making general changes to a design, such as changing the thread palette and design colors, you can edit design objects and even individual stitches. The Edit Objects toolbox provides many tools for reshaping, resizing, rotating objects, as well as add or remove stitch angles. – By using the Partial Appliqué tool, you can create overlapping appliqué objects with partial cover stitching without doubling-up borders. Openwork or ‘cutwork’ embroidery – Is a delicate form of needlework which involves cutting away portions of the background fabric and binding the edges with embroidery stitching. In addition to reinforcing the edges, resulting holes may be filled with embroidery or needle lace. Stumpwork – Is a raised form of embroidery. It is created on one backing fabric and transferred to another, ‘ground fabric’. The software allows you to visualize all components of a stumpwork design in a single design window, plus it lets you edit each stumpwork piece individually. Cross stitching is a popular technique for filling large areas with low stitch counts. It can also be used for outlines and borders. It is suitable for homeware, tablecloths, children's clothes and folk designs. Cross stitch is also sometimes combined with appliqué. Unlike machine embroidery where designs are enhanced with different stitch types, angles, and effects, in cross stitch you can only add dimension to the design with shades of colors. For this reason, most cross stitch designs use many more colors than machine embroidery. If your embroidery is too large or contains a number of designs spaced around an article, you can use the Multi-Hooping toolbox to split it into multiple hoopings. Each one contains an object or group of objects that can be stitched out in a single hooping. These can be stitched consecutively to form the whole design. They can be sent directly to machine or saved to file. The Stitch Player lets you simulate a design stitchout on screen. 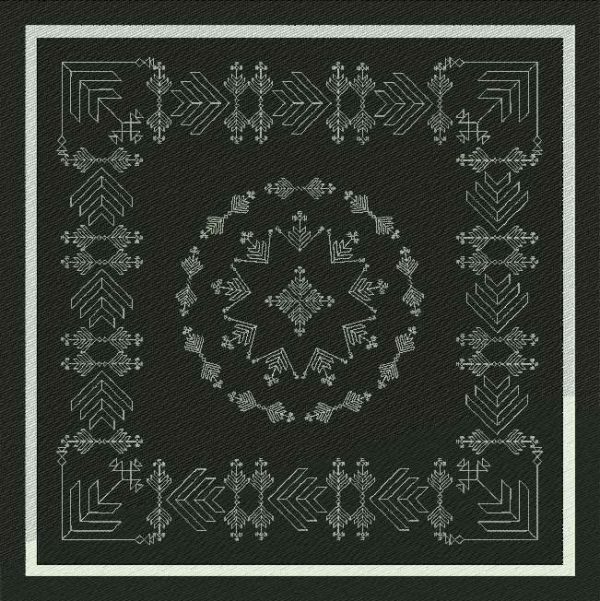 Use it to view stitching and color sequence in slow motion. Simulation can be started from any stitch. With larger designs, scroll automatically so that the area being stitched remains on screen. All with latest service packs installed. Internet connection Required for product activation and registration.